(l-r) Phylicia Rashad attends the Fast Company Grill on March 09, 2019 in Austin, Texas; Toni Morrison receives the Honor Medal of The City of Paris on November 4, 2010 in Paris, France; Andre Holland attends ‘White Noise’ Opening Night at The Public Theater on March 20, 2019 in New York City. 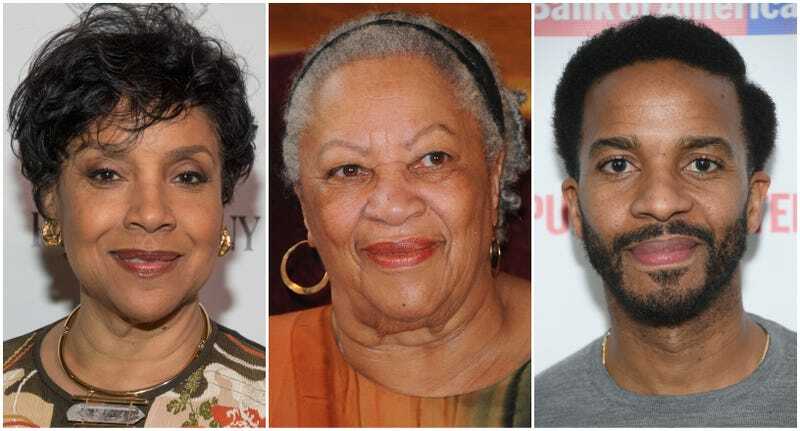 This is a trio that needs to go on tour: On May 23, one of the most coveted tickets of the New York City theatrical season won’t be for any Broadway show, but for famed cultural center 92Y (not to be confused with the YMCA), which will host acclaimed actors Phylicia Rashad and André Holland (Moonlight, Selma) in a dramatic reading of selections from Toni Morrison’s latest book, The Source of Self-Regard: Selected Essays, Speeches, and Meditations. The event was commissioned as part of the 92Y Poetry Center’s 80th anniversary season, and has been curated by Morrison scholar and Chair of Columbia University’s new African American and African Diaspora Studies Department, Professor Farah Jasmine Griffin. Griffin most recently joined the literary icon at 92Y for a conversation about Morrison’s 2015 novel God Help the Child. Proving Morrison to be one of our most incisive cultural critics as well as a creative force, her latest work is a nonfiction collection comprising four decades’ worth of thought on topics as seemingly diverse as feminism, colonization and the colonialist mentality, immigration, and Americanism vs. Africanism. It is equal parts analysis, musing, and eulogy—for Martin Luther King, Jr., James Baldwin and the thousands killed on September 11, 2001. For the Tony-winning Rashad and rising film and Broadway star Holland—who will next appear in the highly anticipated High Flying Bird—to take on the work of one of the world’s most revered writers and intellectuals promises to be nothing short of transcendent (and admittedly, has this writer considering a trip to New York City for this once-in-a-lifetime event). The 92Y’s Unterberg Poetry Center on Thursday, May 23 at 7:30 pm. Tickets will soon be available on their website. While you’re there, take note that Chimamanda Ngozi Adichie will be appearing on May 30 to discuss her new novel, Dear Ijeawele, or a Feminist Manifesto in Fifteen Suggestions, along with writer Nathan Englander.